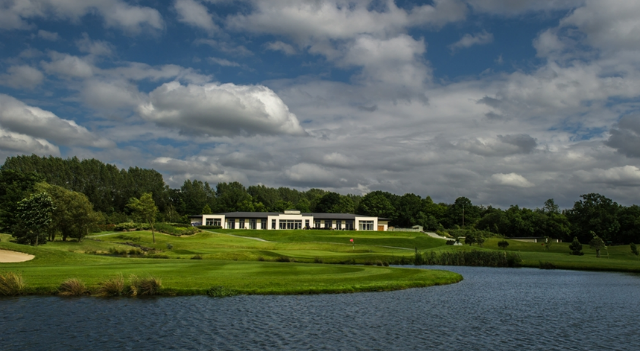 The Shire, located in Barnet, North London opened in 2007 to much acclaim and can boast the late great Seve Ballesteros as it’s architect. 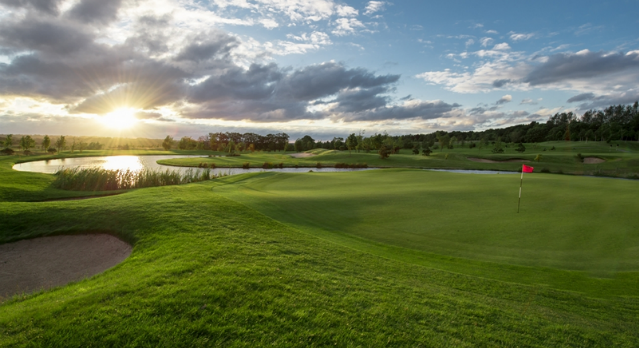 In fact Seve left a permanent imprint on the Hertfordshire landscape by designing the giant S shaped lake that forms the major hazard on the 18th and dominates the view from the clubhouse. 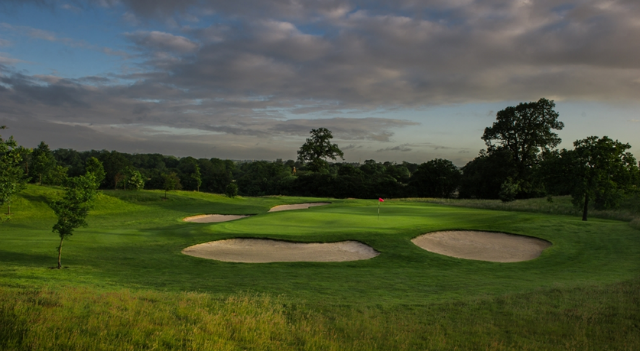 Something of a Seve trademark The Shire, similar to his other designs has an unusual hole configuration – six par 3’s, six par 4’s and six par 5’s. Partly because of this only two consecutive holes have the same par. Like many modern courses there are a range of tees to choose from, which is welcome news as water comes into play on the majority of holes holes and at 7028 yards from the back tee, The Shire shapes up to be a daunting challenge, however playing from the day tee at 6183 the course presents a fair challenge for golfers of all ability. On arrival we were greeted by several friendly members of staff and kicked the day off with a superb breakfast in the clubhouse bar/lounge area. The Shire starts with maybe the most testing Par 3 on the course. Playing from a slightly raised tee, you hit to what is essentially an island green. 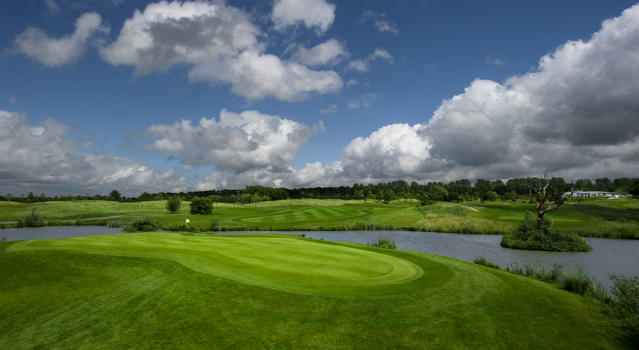 The green is shallow and as result it is tricky to find the correct distance, but do so and you will be rewarded with a good birdie chance to start your round. Water is a common factor on The Shire's Par 3's with five out of the six all carrying a threat of a wet ball from the tee. 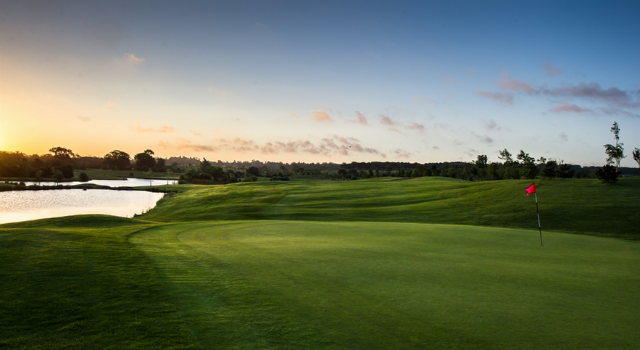 Notably the 4th is a long carry over a lake which runs right up to the front of the green. A brute from the back tees, it is much more forgiving from the forward tees. Make sure you over club on this one! The spectacular 7th is one of the most memorable holes on the course. The green, much like the 1st is again essentially an island. It is beautifully bordered on the front and both sides with sleepers reminding you of the famous 17th hole at TPC Sawgrass. While fairly short it still requires a brave and accurate tee shot to find the putting surface. 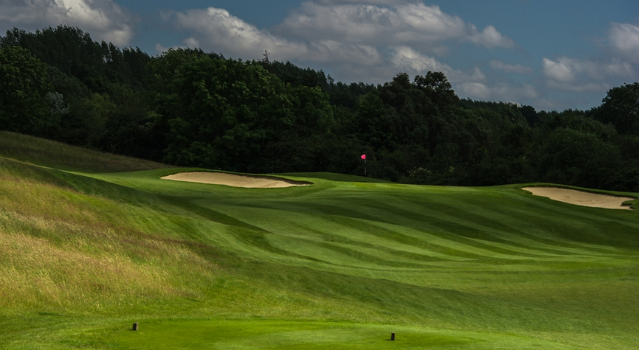 The 17th is also a great par 3 as the back nine builds towards it’s iconic finale. Water is in play both at the front and to the right of the green. A pulled tee shot left will leave you ‘short sided’ facing a tricky up & down. There are many memorable Par 4's on the course, not least the stunning 18th in which you cross the S shaped lake twice, playing to a generous island green. It is a tough finish and fitting finale. 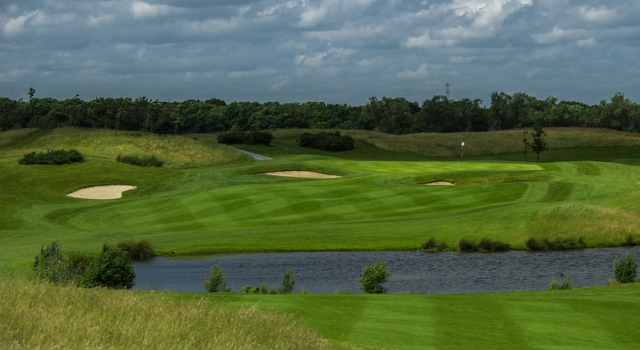 The 2nd is the first par 4 on the course and is dominated by water (there is a theme developing here). Driving from a a raised tee you will need to avoid the water that juts into the fairway at driving distance. Negotiate this safely you will gently climb back up hill to a sloping green. Another notable Par 4 is the 6th. Again water is play from the tee with a large lake waiting for any errant sliced or blocked tee shots. You will not reach the ditch crossing the fairway, but beware of the bunker on left of the fairway. 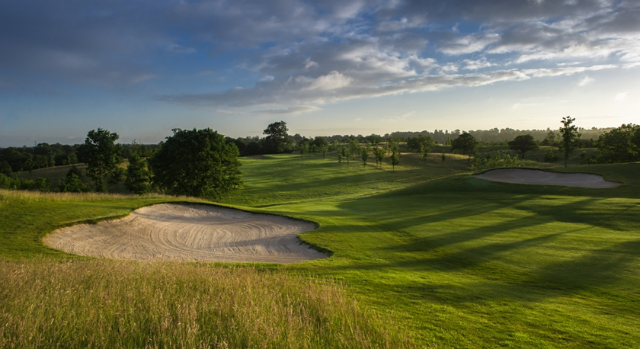 A good drive leaves you with an attractive approach to a green framed by trees and deep bunker situated at the front right of the green. 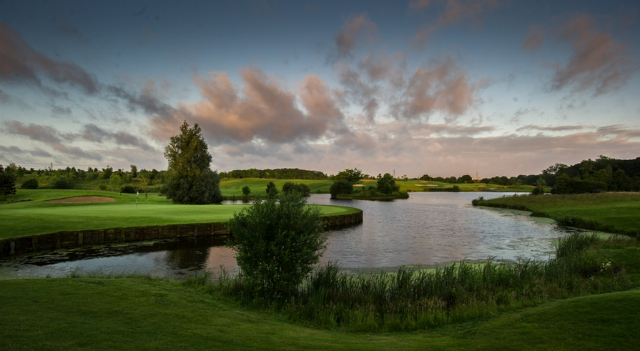 Along with the 18th, the 15th is the most challenging par 4 on the course.It is a dog leg right that sweeps around a large lake and as result you face a real challenge to find the fairway from the tee. 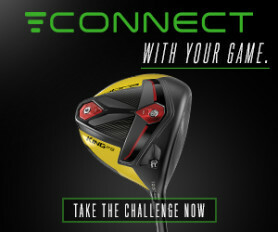 Longer players can choose to play it as a risk-reward hole, taking on a bigger carry from the tee. The green is set into a gentle hill, but any approach shot leaked right will kick down towards and likely into the water! 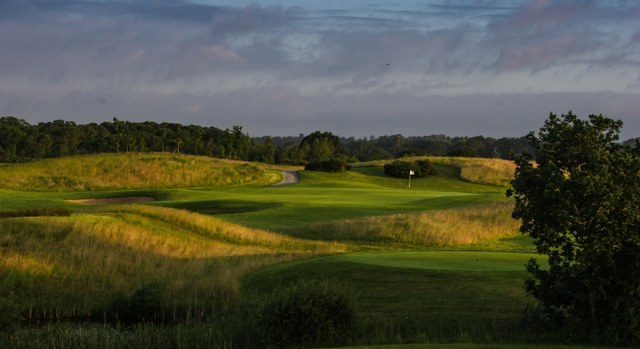 A feature of the course is that there is often a risk-reward aspect to the holes. While water and other hazards play their part, you can on many occasions choose a safe option. This is most evident on The Shire's par 5’s. The first par 5 is the 3rd. Playing from a raised tee the fairway narrows significantly at driver landing distance with water pinching in from both sides, be brave and look to ‘bomb’ one and you will be rewarded with a carry over the water, a wide fairway and chance to reach the green in two. Another notable par 5 is the 11th which doglegs right to left. A stream disects the hole in two meaning much thought is required on the second shot as the fairway runs either side of the stream. It is an exmple of the risk-reward nature of all the par 5's. the long hitter may be able to turn the ball into the green with a drawn fairway metal, but anything with too much shape wil find the water. To be honest it is really hard to pick a signature hole. I imagine The Shire would go for the 18th as it features the 'Seve' lake and that is certainly a contender. If I was to pick one inparticular it would probably be the 15th. A truly great Par 4 although Par 3 7th is not far behind. The Shire is a great test, it was in wonderful condition when I visited despite it being early spring. Certainly the fact that Seve designed the course and clearly had a major input into construction makes it very special. 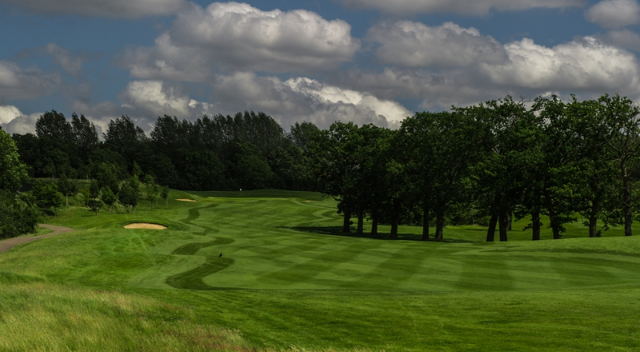 The greens are hugely undulating and some may think a touch too much, but you can image Seve wanting to challenge people to use their imagination, talent and touch on and around the greens. 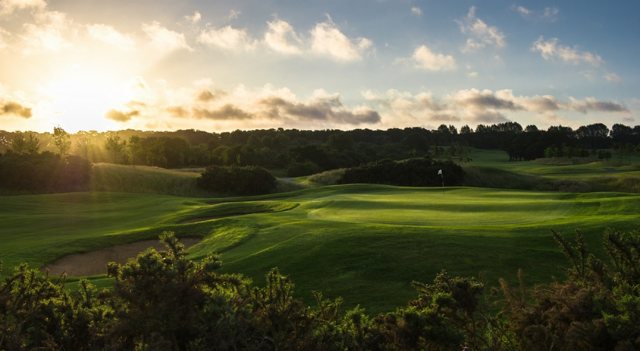 The course maintains it's huge challenge throughout, you are tested to the max from the 1st tee to the 18th green, of course you can temper the challenge by choosing a tee to suite, but whatever your standard you will need to be on your game. A modern challenge, from an old master. 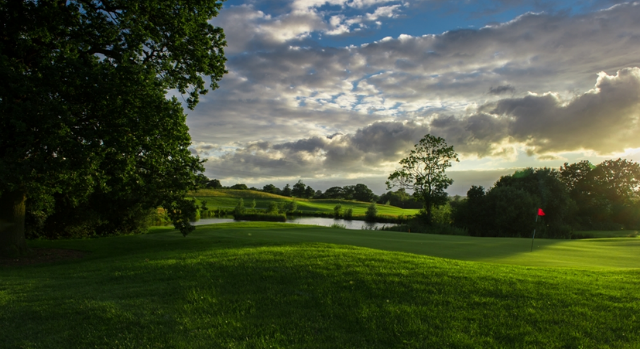 If you have not visited already, The Shire should be on your 'must play' list, just make sure you game is in good order!